After eight discs with the 32 numbered sonatas, and a ninth comprising the early sonatas and sonatinas, Ronald Brautigam now embarks on the second leg of his traversal of Beethoven’s complete music for solo piano. In this volume he gives us the complete Bagatelles, and includes not only the three sets published during Beethoven’s life time, but also thirteen further pieces composed throughout Beethoven’s career, between 1795 and 1825. Some of these pieces, most famously ‘Für Elise’, are sometimes referred to as Bagatelles, others simply as Klavierstücke and several of them are only known by their tempo markings. Among Beethoven’s Bagatelles – whether official or unofficial ones – are pieces that may originally have been intended as movements of piano sonatas, as well as pieces of an extreme brevity, such as the 11 seconds long Allegramente, No. 10 of Elf Neue Bagatellen, Op.119.They left many of his contemporaries perplexed – the music publisher Peters reportedly turned down the Op.119 set, with the comment that such trivia was beneath Beethoven’s dignity, and might harm his reputation if published. What few suspected at the time was that the Bagatelles were to have an immense importance to the piano literature of the 19th century, and to the genre of the character piece. Previous volumes in this cycle have been highly praised by reviewers around the world, for instance in Gramophone, whose reviewer described the performances of the Waldstein and Appassionata Sonatas as ‘stunning … technically breathtaking, stylistically astute, emotionally intense and musically alive in every moment’. 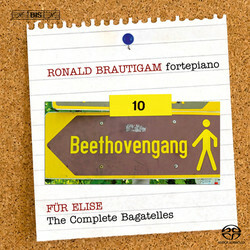 Ronald Brautigam brings no less commitment to the present collection of Kleinigkeiten – as Beethoven himself called them – performing the various pieces on two different fortepianos to accord with the types of instruments that the composer would have had at his disposal when writing them.